Het Steen is considered the oldest building in Antwerpen and was originally built around 1200-25, om the site of an earlier defensive structure first built in the ninth century. However, the upper part of the building, which is easily distinguishable by its lighter sandstone colour, is from 1590. The design is attributed to Domien de Waghemakere and Rombout Keldermans. All the adjoining streets and houses, including the city's oldest church, were demolished in the 1880s as the quays to the river were straightened. The fortress was also threatened with demolition at one point. A neo-gothic wing was added in 1889-90 and various other restorations and alterations were made, though some of this was removed in 1958. The 16th century gate was rebuilt in 1963. The building served as a prison from 1303 to 1827 and became a museum in 1864. The Cathedral of Our Lady is the largest gothic church in the Low Countries and was primarily built in the period 1352-1521. Work first began on the choir, which was finally vaulted in 1411 after political upheavals had forced a standstill for 22 years. The original architect was possible Jacob van Tienen. Pieter Appelmans took over from 1419 and was later succeeded by Jan Tac and Everaert Spoorwater, who extended the original design in 1454-69. The south aisle was completed in 1469 and was consecrated for temporary use in 1469 before church service was moved to the choir in 1481. The last remnant of the previous 12-century church was demolished in 1485. Herman de Waghemakere took over as architect in 1473 and the central part of the west front was completed in 1492 before his son Domien completed the northern tower 1521. A plan to expand the choir was abandoned in 1537 and work on the completion of the southern tower was never resumed after it stopped in 1475. The onion cupola was added in 1535 and the transepts were vaulted in stone in 1610-17. New portals were added during this period but the transepts were restored to gothic style in the 19th century. The interior is largely baroque due to the iconoclasm of the Calvinists. The earliest religious building on the site was a chapel from the ninth century. It took over 150 years to complete Sint-Jacobskerk, though the west tower was mostly finished in the first building phase of 1491-1553. The design is probably by Herman Waghemakere the Elder and his sons Herman and Domien, followed after 1525 by Rombout Keldermans. The plan was originally to build the tallest tower in Antwerp, but the project was held up due to a lack of funds. Two building phases followed: in 1552-66, with the completion of the transepts, and in 1602-56, with the completion of the choir, chapels and aisles. The site was originally located just outside the city walls and became a popular stop on the pilgrim route to Santiago de Compostela. A chapel had been built in 1404-13, which became an independent parish in 1477. 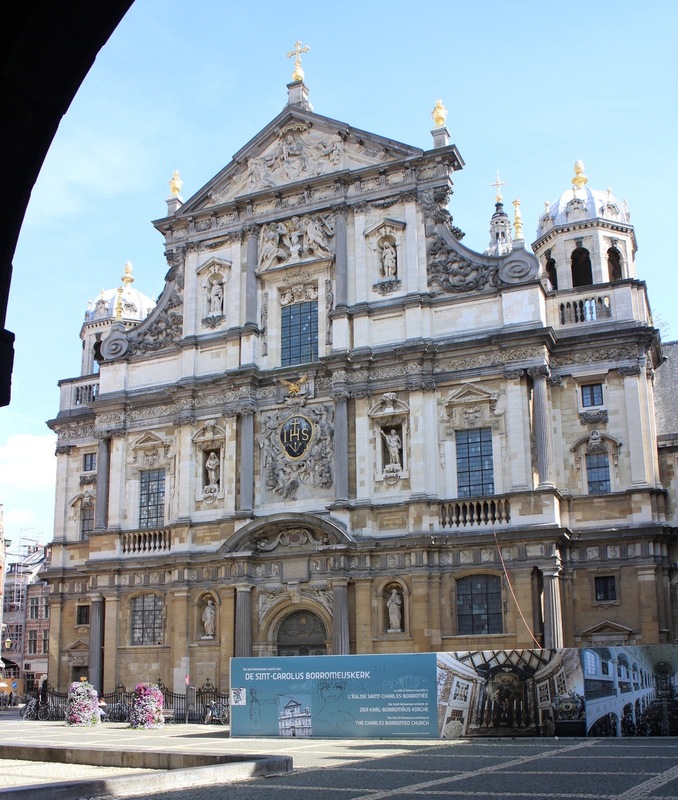 The construction of Sint-Andrieskerk was begun by Augustine friars in the early 16th century to replace a chapel from 1513-14. The land was confiscated due to the accusation of protestant sympathies and the church became a parish in 1529. The construction of the tower began in 1541 and the nave was completed around 1568. A dividing wall was built to separate between Calvinists and Catholics in 1579, though this was torn down in 1585, when the Spanish restored the supremacy of Catholicism. Transepts and choir were only completed in 1663. A new portal was added to the south transept in 1730 and the tower collapsed in 1755. A new tower was subsequently completed to a design by Engelbert Baets. 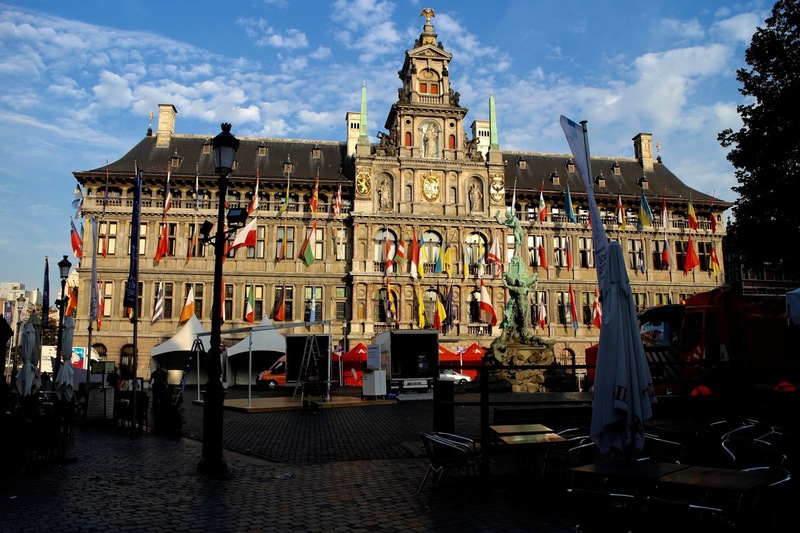 The Antwerp town hall was built in 1561-64 to a design by a team of architects, though it's primarily attributed to the sculptor Cornelis Floris de Vriendt. Other names include Loys de Foys, Nicolo Scarini and Willem Paludanus. The city had previously chosen a gothic design by Domien de Waghemakere in 1541, but the building materials for this project were eventually diverted to the city's defences instead. The new town hall was destroyed during the Spanish sack of 1576 and had to be rebuilt three years later. The buildings on the south-side of Helige Geeststraat are typical examples of the Flemish renaissance style in brick-and-sandstone. They are dated by the anchors on the facades to the period 1578-84, They are now part of the museum Plantin-Moretus, which is dedicated to the history of the printing press in the city. The guildhalls of Grote Markt are mostly reconstructions, based on paintings and old documents of the houses as built in the late 16th and early 17th centuries. The first reconstruction was completed in 1893 (Grote Markt 7) by architect Frans van Dijck and is considered the most authentic, along with Grote Markt 5. It is topped with a statue of St George by Jef Lambeaux, who also designed the Brabo fountain from 1887. More reconstructions followed on the corner of Braderijstraat in 1900 by Eugene Geefs. This house (Grote Markt 3) only became a corner building when the street was widened in 1886-87. Frans van Dijck completed the reconstructions of Grote Markt 9 and 11 in 1904 and 1906, while Grote Markt 5 is by Leonard Blomme and was finished in 1907. The facades of the two remaining houses on the corner of Wisselstraat were only completed in 1947-49, by Henri van Dijck. The Jesuit church, originally dedicated to St Ignatius, was built in 1615-21 to a design by Francois d'Aguilon and Pieter Huyssens. The adjoining buildings were completed in 1626. The vault of the church was originally decorated with paintings by Peter Paul Rubens but this was destroyed by a fire in 1718. The Jesuit order was suppressed in 1773 and the church was closed before being rededicated to St Charles Borromeo and becoming a parish in 1803. Paleis op de Meir was built in 1745-48 as a merchant's palace by architect Jan Pieter van Baurscheidt the younger. It was acquired by Napoleon during the French occupation and furnished to become a royal palace, but was first used by the monarchs of the United Kingdom of the Netherlands and after 1830 by the monarchs of the Kingdom of Belgium. The royal family donated the residence to the state in 1969 and it has since mostly housed various museums. The building on the right was built in 1908 by architect Emile Thielens for Banque de Reports. The National Bank of Antwerpen was built in 1874-78 as branch to the central bank of Belgium. The architect was Henri Beyaert, who had already built the headquarters in Brussels in collaboration with Wijnand Janssens. The city walls had been demolished in 1866 and a plot was found in 1871 on the vacant land along the new boulevard. The Antwerpen branch was closed in 2013 and the building was offered for sale. The Royal Atheneum on Franklin Rooseveltplaats was built in 1882-84 to a design by architect Pieter Dens and Ferdinand Truyman. The building was almost completely destroyed in a fire in 2004 and was reopened after extensive rebuilding in 2014. The institution was first founded by Napoleon in 1807 as the city's first public school and was previously housed on Sint-Jacobsmaarkt. The town hall of the previously independent municipality of Borgerhout was built in 1886-89 to a design by brothers Leonard and Henri Blomme. 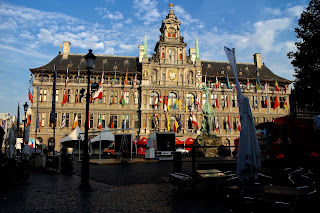 Borgerhout became part of Antwerp in 1983 and the town hall is now referred to as a district house. The Royal Museum of Fine Arts was built in 1884-94 to a design by architects Jacob Winders and Frans van Dijk. The institution was originally founded in 1806 by Napoleon, when a collection was made from the art taken from the city's churches and other buildings. The collection was previously housed in a monastery but a decision was made to build a new museum after a fire threatened to destroy it in 1873. The museum was hit by a bomb in 1944 and subsequently restored. The pilot office of the port of Antwerp was built in 1892-95 to a design by architects Hendrik Kennes and Ferdinand Truyman. A competition was held in 1886 but none of the winning projects were realised due to public protests. The issue was subsequently solved in 1890. City architect Gustave Royers added a smaller building to the south in 1899 and later structures are from 1937-57. A former ministry houses from 1863 by architect Charles Dujardin stands behind the pilot office. The former dairy building of Antwerp Zoo was built in 1898 to a design by architects Emile Thielens and Emil van Averbeke. It was originally used as a distribution hub for the milk produced by the zoo's cows but later came used for storage before it was converted into a planetarium in 1973. It's now an education centre. The buildings of the residential street Cogels-Osylei in the district of Zurenborg were built between 1894 to 1908. The development was led by a company called Societe Anonyme, which had originally been set up to to develop the farmland of the southeastern fringes of the city into industrial estates, but which changed its business model to focus on high-end residential development in 1886. All buildings on the Ronde Plein, which is located halfway up the street, were designed by Ernest Dieltiens and built in 1897-99. The building, which now houses the department store Galleria Inno, was built in 1900-01 to a design by architect Joseph Hertogs. The German merchant Leonhard Tietz had already opened a store in the city, on Melkmarkt, in 1897, which continued as a branch until 1907. The new department store on the Meir soon proved too small and Tietz began to rent premises in the adjacent corner building, which had been built in 1903 by architect Willem van Oenen for the electrical store Moyson. The three art nouveau houses on the corner of Schilderstraat and Plaatsnijdersstraat were built in 1901 to a design by architect Frans Smet-Verhas. The construction was financed by a wealthy shipbuilder, which is why the corner balcony is in the shape of a boat. There were originally four houses but one was rebuilt in 1964. The architect designed similar facades for houses in Oudekerkstraat and Lange van Ruusbroecstraat. The short street between the Meir and Teniersplaats has been named Leysstraat since 1867. It was previously a little ally known as Meirsteeg but was widened in 1855 to serve as part of a thoroughfare to the central station. It was widened again in 1898 and an effort was made to harmonise the style of the new commercial buildings. Most on the southern side were built in 1899-1900 to designs by architects JB Veerecken, Emile Thielens, Louis Gife and Floris Verbraeken, though the corner building on the right was completed in 1904 by Willem van Oenen. The near-identical buildings Leysstraat 28-32 and 27-29 on Teniersplaats were completed in 1901 and 1904 to designs by architects Ernest Dieltiens and H.F van Dijk. The latter is the former Hotel Metropole. Antwerpen-Centraal railway station was built in 1895-1905 to a design by architect Louis Delacenserie. Six of the eight towers were demolished in the 1950s but these were reconstructed in 2009. The glass vault of the viaduct was designed by Jan van Asperen. The previous station was a wooden structure from 1854. The buildings on the right are from 1903 by architects Emile Thielens and Emiel van Averbeke. This Venetian-inspired Scaldis complex on Gogels-Osylei, was begun in 1903 to a design by Frans van Dijk. It consists of four townhouses and is similar in composition to the earlier Apollo complex further up the street, from 1894 by Ernest Stordiau. The names Scaldis is Latin for the river Scheldt. The building on its left is from 1905 by architect Fr. Reusens. The Vlaamse Opera was built in 1904-07 to a design by architects Alexis van Mechelen and Emiel van Averbeke. It was originally established in 1893 as the Dutch-speaking counterpoint to the royal theatre, which was completed by Pierre Bourla in 1834, where performances continued in French until 1933. The earliest performances was in a theatre from 1869-73 to design by Peter Diens, which was demolished in the 1960s. The new opera replaced a market hall known as Halles Centrales from 1892 by Ernest Dieltens. The building on the left is an extension from 1907-09, while the tower on the right is Antwerp Tower, completed in 1974 by Joseph Fuyen and Guy Peeters. Boerentoren, or KBC Tower, was built in 1929-32 to a design by Jan van Hoenacker and is considered one of Europe's earliest skyscrapers. Originally at 87.5 metres, it was just a few metres short of the Royal Liver Building in Liverpool and lost the title as tallest building on the continent to Terrazza Martini Tower in Genoa in 1940. The tower was extended to 95.8 metres in 1976 but is still shorter than the 123-metre tall spire of the cathedral. Most of the facades on the southern side of Grote Markt are reconstructions from the period 1947-57 and 1967. The corner building furthest to the right is from 1886, while the corner building on Maalderijstraat is considered an authentic restoration of a facade from 1736, by architect Jan Peter van Baurscheidt. This row of houses originally belonged to a street called Maanstraat, but has had an uninterrupted view to square since the houses in front were demolished in 1714. The two facades on the very left of the image are considered authentic restorations of 17th- and 18th-century facades. The Museum of Modern Art in Antwerp is housed in an old granary from 1922 built by Société Anonyme. The main facade by architect Camille Janssens consists of three blind arcades, which are still visible on Leuvenstraat. The granary was converted to a museum to a design by Michel Grandsard in 1985-87 and was extended by the same architect in 1992-93. Cogels-Osylei 29A is a rare modern addition to the street and was built in 1989 to a design by Christine Conix. The site was cleared in 1933 when a previous building from 1897 was demolished, the adjoining building (left) was completed in 1949 in a pseudo-traditional style. The building on the right includes three town houses and was designed by Joseph Bascourt in 1894. Further on the left is the previously mentioned Apollo complex. The new courthouse was built in 2001-05 to a design by architect Richard Rogers on the former site of a railway station, which was opened in 1903 but demolished in 1965 to make way for access roads to the Kennedy tunnel. Rogers' project won a competition in 1998-99 and a new tunnel was completed at the same time. The train station was a monumental building by brothers Jean Jules and Paul van Ysendijck, while the old courthouse from 1871-74, still stands on Britselei and was built by Francois and Louis Baeckelmans. Museum Aan de Stroom (MAS), which means Museum by the River, was built in 2006-11 to a design by Neutelings Riedijk architects. The decision was made in 1998 to a build a new museum, with exhibitions focusing on the history of the city and its role as a major international port. The building is 60 metres tall and stands at the site of the former Hanzehuis, which was built in 1564-68 and was one of the city's most prominent renaissance buildings before it was destroyed in a fire in the 19th century.